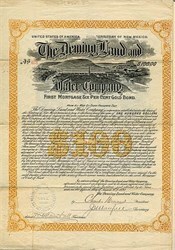 Beautifully engraved RARE uncancelled Gold Bond certificate from the Deming Land And Water Company issued in 1892. This historic document has an ornate border around it with a vignette of a small city surrounded by water with a manufacturing facility. This item is hand signed by the Company's President, Secretary, and Treasurer and is over 112 years old. The certificate has been folded and shows some wear on the folds. Overall in fine condition.